“I found Pinotage to be an intriguing wine. Its taste varies considerably even between neighboring Stellenbosch estates. What I found to stay constant between vintages and estates, though, was a deep red wine with smoky and earthy flavors, mineral undertones, and sometimes notes of tropical fruits. Sound unusal? It was. Not quite as full bodied as a Shiraz, but not as heavy as a Cab Sauv. I tried a Simonsig RedHill Pinotage (2004) there which definitely satisfied (although if I had a bottle I’d age it a bit longer). But what I was really pleased with was a Pinotage (2005) I tried at Middlevlei estate. I didn’t find it as “big” as the Simonsig, but it was a nice, medium-bodied wine, not overpowering with its black berry flavors, with a nice hint of oak and smoke. Something to be had with a nice, spiced red meat dish (from the braai, perhaps?). And a few sips into the glass, there was something about the wine’s flavor that still played with my taste buds – exactly what I like in a glass of wine, a bit of mystery and adventure with an unfamiliar varietal!" It wasn’t meant to be a séance, but after I poured Soljans Estate Gisborne 1998 (New Zealand) Pinotage we found ourselves trying to raise the ghost of a wine that was long past it*. It was a thin pale brown-red colour. There was a faint taste of raspberries and a great deal of acidity with a sour finish. Not pleasant at all, so we turned to another 1998 wine, Groenkloof (now Darling Cellars) made by Abé Beukes, which was a Top 10 winner in 1999. Deeper colour, browning edge, there’s some mintiness with strawberry and Victoria plum fruit flavours but the fruit is fading fast in the glass even as we sip, and the séance can’t bring it back. We can’t face a second glass. So I grab a wine from the ready rack. To the rescue comes The Wine Society Exhibition Pinotage 2003 (£8.95). This was made by Francois Naudé at L’Avenir Estate from mostly his younger vines (18 & 23 yo) and matured in used barrels to give a lighter fruitier style. This had everything we could want: lots of life and punchy blackberry flavours with tobacco leaf. With the séance over, the inquest started. Who killed Soljans and Groenkloof? The smoking gun was to hand; I could see the culprit’s face reflected in the glass. It was me. I had kept the wines too long. I have a temperature controlled cellar,I stick wines away to mature and I sometimes leave them too long. 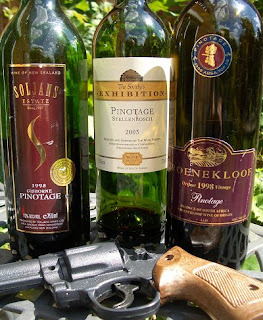 The Soljans was dead – but the Groenkloof was of interest to devotees of mature wines. Problem is my tastes have changed. I used to like old wines but I am finding that they hold less attraction now. As I get older, I prefer more youthful wines. I’ll be going through my Cellartracker records to find my other oldies that need opening. *Interesting to note the upward trend in alcohol levels; both the 1998 wines were 13% alcohol by volume while the 2003 wine was 14.5%abv, and to be fair, Soljans back label did say that it was an ideal 'drink young' wine. "It’s a pleasant surprise to find a Pinotage that not only is elegant but also made in the U.S." writes Jean Deitz Sexton on Appellation America.com . 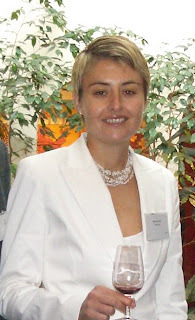 "Domenico Wines has produced a gorgeous Pinotage: the 2004 Domenico Amador County Pinotage. One of the things I like about this wine is that it is juicy – none of that unctuous, heavy mouth feel that so often creeps into California wines. It has a luscious blueberry nose, notes of blackberry and cayenne pepper on the mid palate and notes of tobacco, cigar and earth but in the right balance to add interest and depth. The tannins are evident and the finish is long and satisfying. This wine can stand up to hearty fare." Domenico is a new name to me, and I am glad to welcome them to the Pinotage family. 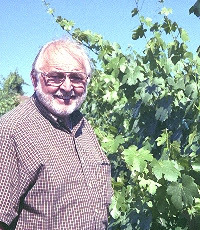 They are not growing Pinotage themselves, but have bought them from California's largest Pinotage vineyard, Sutter Creek Vineyards which I visited in 2002 and whose own tasty Pinotage is sold under the Sutter Ridge label. The vineyards was planted by John Bree Snr (pictured right in his Pinotage vineyard). Sutter Creek is on a ridge high in Amador County which is in the foot-hills along the Nevada border. The 2007 harvest dawned on Simonsig with no forewarning. The early summer prelude to the 2007 vintage was perfectly cool up to mid January when temperatures rose dramatically and Mother nature prematurely gave birth to the fruit of yet another years’ labour – heralding the earliest start in the history of the estate. And heartiest congratulations to Simonsig winemakers Van Zyl du Toit and Debbie Burden (pictured right) whose engagement the newsletter announces. “A mild early part of summer with December and early January being the coolest in 30 years, the reverse of the season in Europe it seems, was a sign of an excellent harvest to come. The grapes on the vines were looking fantastic – healthy, small berries and there were already some great flavours in the early varieties. Mellasat is another name new to me, and having discovered them I can report that there is good news and bad news. The good news is that they have made some super Pinotages but the bad news is that are ceasing production -- 2002 was the last -- and are instead using the fruit to meet demand for their succesful flagship Mellasat'M' - a Cape Blend of Shiraz, Pinotage and Cabernet Sauvignon. Mellasat is located in the Klein Drakenstein foothills above Paarl and is owned by the Richardson Family. Owner/winemaker Stephen Richardson is a British farmer from Norfolk, England who purchased Dekkersvlei farm in 1996 and set about restoring its Victorian wine cellar, installing modern equipment and planting red varieties. The name 'Mellasat' is an anagram of the first two letters of each of the family members names. They have an entry level series named Dekkers Valley and the premium Mellasat range. 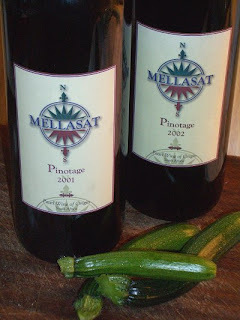 I tasted the Mellasat 2001 and 2002 Pinotage (pictured above with some just picked home grown courgettes) over two nights. Incredibly dense black colour, brick rim. Full bodied mature wine with soft mulberry fruit flavours, peppery and with a spicy finish. Dense colour, red rim. Brightberry fruit on front palate, some chocolate and toffee flavours, soft tannins and a really spicy finish. Our small tasting panel was equally divided between the two wines, half preferring the more restrained integrated mature 2001 and half the fruitier and more acidic 2002. Both wines had a lot of loose sediment needing careful pouring or decanting. I was impressed with the corks used, top quality 2-inch long polished corks. These wines are nothing like as famous as Dom Pérignon, Ernie Els or Biondi-Santi. Nor would they claim to be as ambitious. But in their own understated way, they represent something that is far more to my taste: good, honest winemaking at a fair price." 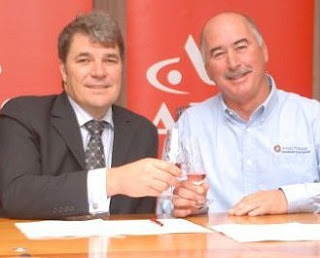 Absa bank yesterday (21/07/07) signed a five-year sponsorship deal worth one million rand per year with the Pinotage Association. Absa Bank and the Pinotage Association intend an ambitious promotional and media drive to capitalise on the success of the past and to take the brand to the next level. Several programmes will be rolled out, working toward positioning Pinotage for 2010. These will include a project with Absa Art later this year and a Food and Wine programme in 2008. Picture: Dr Steve Booysen (left) and Beyers Truter celebrating with a glass of sparkling pink Pinotage. Teva is a range of wines from the Binyamina Wines which, as you probably have already guessed from the lettering on the label, is in Israel. Binyamini is one of Israel's larger wineries and it is located in the town of the same name in the foothills of the Carmel Mountains. The winery dates from 1952 and after being bought by a group of investors in 1992 has benefited from an influx of new ideas, modern technology,replanting of vineyards and introduction of new varieties such as Viognier, Zinfandel, Tempranillo and Pinotage. This 2006 vintage is their very first varietal Pinotage, made from a vineyard planted in 2002. So it is a young wine in both senses; the grapes were harvested in August 06 and the wine had minimal French oak ageing, spending three months in second fill barrels used previously for Chardonnay. 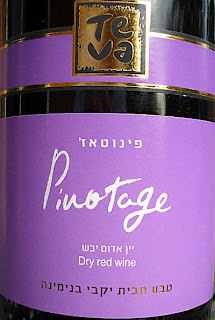 Israel now has two wineries producing Pinotage, Binyamina and Barkan. My good friend Daniel Rogov is the guru on Israeli wine, and his annual guide to its wine industry with detailed tasting notes of every Israeli wine is a must. My thanks to Ilan Hasson of Binyamina Wines for sending me this sample, and to Rogov for background information. 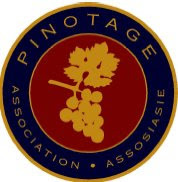 The annual Pinotage Top 10 Competition has been opened to all comers. The first competition in 1997 had just 49 entries while last year attracted 130. ABSA is part of the Barclays group who have taken winning wines and their winemakers to London, Hong Kong and Singapore to showcase their wines to Barclays international clients, giving the wines even wider exposure. The judges for the competition will be Duimpie Bayly, Charles Hopkins, Chris Roux, Dave Hughes, Neil Pendock, Michelle Cherutti-Kowal (wine lecturer in England) and Julian Brind (Master of Wine from England). They will taste all the wines, then retaste the 20 highest scoring wines to find the final Top 10. "If you're a wine aficionado", writes Madeline Triffon in Detroit News (12 July 2007) , "smacking your lips at the thought of a unique 'something' that resists easy definition, how can you avoid the adventure of buying Pinotage? Spend a little money. Cellar some bottles for a time. Look to be entertained and surprised." The "don't miss" wine that has inspired her enthusiasm is Fort Ross Pinotage 2003, from California. "An elegant American Pinotage with delicious red berry fruit, oak spice and length. "You'll be hard-pressed to find commercial plantings of Pinotage outside of South Africa. Here's one that's a superlative ambassador for South Africa's signature red grape... grown in Sonoma! Both red and black fruits abound, dark cherry, red plum, strawberry. There's well-integrated vanillin oak. The wine's flavor is vaguely Rhine-esque, with spice, warmth and well-mannered dryness. It doesn't need food to sing, but will be flexible with a range of dishes. Balanced, medium-bodied and smooth, it speaks 'quality.'" 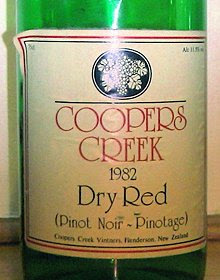 New Zealander Paul Sharp came across this bottle of Coopers Creek * 1982 Pinot Noir - Pinotage. "Hopes were certainly not high amongst those present," he writes, "yet I was very confident mainly due to the Pinotage component. The much-maligned variety seems to have amazing longevity particularly in wines from around the Auckland area within New Zealand. While not an outstanding wine, it held together convincingly throughout 20 minutes in the glass and never threatened to disintegrate. Flavours and aromas were olive and herbal notes but beyond that it was really quite nondescript. However the palate was smooth and full and rather pleasant. All in all quite a surprise from a 25 year old bottle that would not be considered an aging wine." I have little experience of NZ Pinotage and none at all of old ones, and I am intrigued to learn that Auckland's Pinotages have a reputation for longevity. Paul Sharp is founder-director of Global Wine Consultants Ltd, based in Auckland, New Zealand. The above review and photograph come from Paul's blog at www.wineconsultant.co.nz and are reproduced here with his kind permission. *Coopers Creek have achieved fame recently as the producer of the very popular Cat's Pee on a Gooseberry Bush Sauvignon Blanc -- one of the labels featured in my book. “Uh huh,” I thought. “Cold coming”. A tickle in the throat and a blocked nose presages a cold which is a real inhibitor on enjoying wine. So I decided to open a ‘special’ wine, one that I had been saving so that I’d have good memories to carry me over the cold. 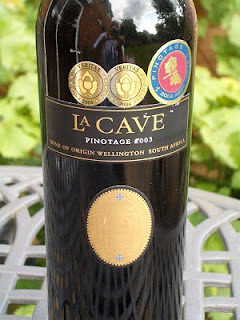 ‘La Cave’ 2003 Pinotage from Wamakersvallei is one of my favourite Pinotages, and since Wamakersvallei’s wines are unfortunately not available in the UK, this was a rare bottle I’d carried back from the Cape. And it tasted just as good again. This is a delightful serious wine with restrained fruit and great structure, very integrated, no rough edges. You know what it reminds me of? Vergelegen’s estate red. Platter is a bit sniffy about the 2003 vintage La Cave, but ignore them. This is a great wine. If you’ve got a bottle, please do let me know what you think. Well, I now know about SAAM and have tasted their cracking good Pinotage Viognier. Kobus de Kock, one of the winemakers at Pederberg Winery emailed - “No wonder you have never heard about SAAM . SAAM is a brand-new jointly owned label. The parties are Bibendum (one the UK's biggest wine companies) on the marketing and distribution side, and Perdeberg Winery on the production side. Saam Mountain Vineyards is a collective of forty South African growers with low producing vineyards (less than 7 tonnes per hectare) located from Paarl to the Durbanville Hills. Saam Mountain’s home is a 1688 farmhouse (the oldest registered building in South Africa) at Eensaamheid Farm at the foot of Perdeberg Mountain, in Paarl. The winemaker is Pieter Carstens, from Pederberg Winery, who has been tasked with making ‘wines with unusual degree of complexity and intensity at affordable prices’. The basic wines will be priced around £5.99 in the UK with a premium single block selection – where each wine has the Afrikaans name of the vineyard block from which the grapes were sourced - priced from £7.99 -£10.50. Courtesy of Bibendum, I got my hands on a bottle of their just launched SAAM Pinotage Viognier 2006. It comes in on a heavy bottle with a classy looking label whose illustration appears to be a mountain range formed of embossed very pale grey zebra stripes which gives a pleasant tactile feel. The words Heldersig appear on the front and back label where the text says “Our Heldersig (Clear View) Pinotage Viognier) is produced from small batches of specially selected grapes”, but there is no mention that this is a single vineyard wine, which seems to be a missed marketing opportunity. The wine is dark in the glass, with a minty nose and a purple rim you'd expect from such a young wine. The first impression is of ripe juicy plummy fruit. Red berry flavours are to the fore, and underneath there are subtle hints of chocolate and tobacco. There’s an attractive silky texture to this wine, it is 13.%abv but it feels quite powerful and it will be interesting to see how the wine develops in the bottle. Excellent. Pieter Carstens co-fermented Pinotage with a little (3%) aromatic white Viognier, a practise common in the Rhone where Syrah is co-fermented with Viognier and, instead of diluting the red Syrah, a chemical reaction with Viognier during fermentation extracts more colour and flavour and adds complexity. This is only the second co-fermented Pinotage I know of, and the results are so promising I expect more to follow. Saam Mountain Heldersig Pinotage/Viognier 2006 retails at £8.95. 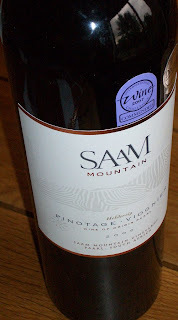 There are two more Pinotages, Saam Mountain Paarl Pinotage 2006 (£5.95 closed with a screwcap hooray! (- my wine had a composite closure)) and Saam Mountain Leeuwenkuil Pinotage 2006 (£8.95). All the Pinotages are Paarl Wine of Origin. There are another eight wines in the SAAM range. Saam Mountain Vineyards website is at http://www.saam-mountain.com/. 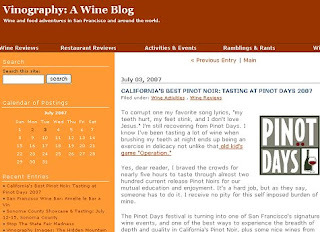 Alder Yarrow of Vinography tasted and rated 193 wines at San Francisico's annual Pinot Days festival of Pinot Noir, held 29 June - 1 July 2007 . He says "I braved the crowds for nearly five hours to taste through almost two hundred current release Pinot Noirs for our mutual education and enjoyment. The Pinot Days festival is turning into one of San Francisco's signature wine events, and one of the best ways to experience the breadth of depth and quality in California's Pinot Noir, plus some nice wines from further afield." Alone among the all those hundreds of Pinot Noirs from California and Burgundy was one Pinotage -- Fort Ross 2003. And guess which wine appeared in his group of eight highest scoring wines? "Anyone who is unconvinced as to the merits of Pinotage should get stuck into this. Rich, characterful fruit with a fine tannic structure, this well-priced Pinotage really delivers. Spicy, fruity, and very moreish, it makes you wonder why you ever doubted he variety in the first place. Absolutely no bubblegum notes - guaranteed."